Everyone wants to be happy, but only a few can live the ‘finer life’ – one which compels you to wake up every morning excited and raring to go and see what the day ahead has in store for you. Two aspirations can bring out your adrenaline and motivation to fuel this energetic state: good health and physical attractiveness. A healthy mind and body functioning at optimum peak doesn’t only enable us to perform – it also strengthens endurance to combat stress that comes our way. Focus and mental discipline is key to crafting solutions and creating results that our clients and bosses expect from us. Meanwhile, physical attractiveness and positive outlook draws in the friends and social life to balance off our daily work grind. Feeling good because you know you look good is a great self-confidence booster, allowing us to open up to better opportunities, whether professional or personal. Premium HyC150 recently introduced in the country is widely regarded by Fine Japan customers in Europe, the U.S., and Asia as the modern-day “fountain of youth.” Its combined ingredients of collagen and hyaluron are proven to counter the effects of the aging process, lubricate joints and ligaments for stronger physical feats, and moisturize the skin for a more youthful, blemish-free look. The company also offers FINE Pearl Coix which helps brighten the Filipina brown “morena” skin, making you look luminous. The FINE Multi-Vitamin has all the vitamins needed to keep our organs and physiological systems running while protecting us from illness and the oxidants that cause them. Included are Vitamin B, Vitamin B2, Vitamin B6, Vitamin B12, and Vitamin E, just to name a few. For those who want more concentrated amounts, the FINE Vitamin B ramps up our body’s energy while the FINE Vitamin C keeps our heart pumping, thriving, and healthy. If you’re not getting enough vegetables in your diet, the FINE Young Barley Grass is a more-than-adequate supplement that provides all the nutrients found in those staples. It is known for keeping our cholesterol and sugar levels low, preventing the onset of diabetes and heart-related illnesses. Augment this with the FINE Chlorella which improves our digestive system and deters constipation; another complementary supplement is the FINE Tumeric Extract Powder which strengthens liver function. If you’ve been struggling with body odors that no perfume or amount of cleansing can remove, the FINE Etiquette Rose can remove this one source of embarrassment permanently. Meanwhile, if stubborn seemingly irremovable fat is your problem, the FINE Metabo Coffee is an effective slimming tool that also promotes colon health. Tea lovers will take to the FINE Ginger Black Tea with its exquisite taste and ability to power up your metabolism. A great day starts and ends with restful sleep, which the FINE Glycine Premium ensures by soothing the stressed-out nervous system while repairing damaged tissue. Our daily grind can be transformed into something extraordinary. 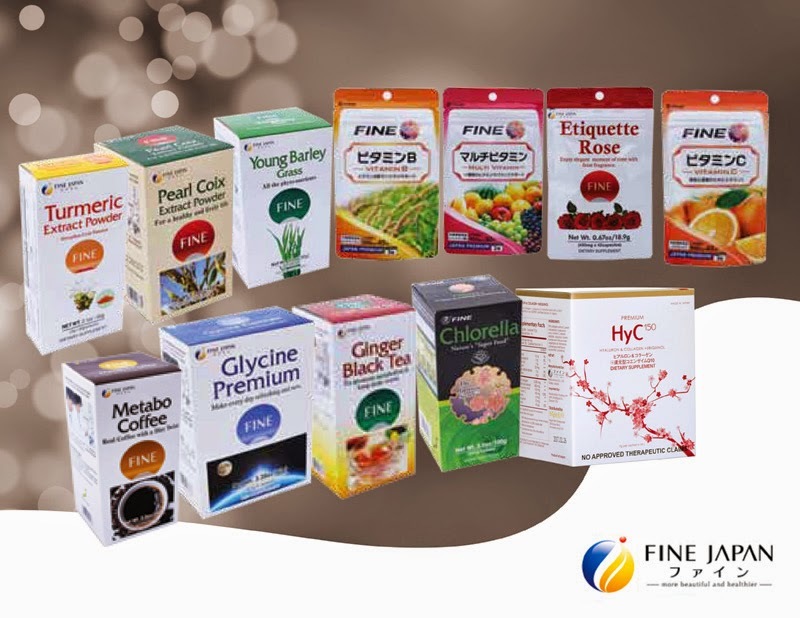 A ‘finer’ life is achievable, through the health and wellness brought to by Fine Co. Ltd.’s nutritional products. So nice to have those products here. Sana lang walang side effects. :/ Medyo cautious ako with ingested products eh.